Otto Lilienthal Flying, May 29, 1895. Interest in aviation (design, development, production, operation and flight of heavier-than-air machines) can be traced back as far as Leonardo da Vinci. However, real progress toward achieving flight in heavier-than-air machines only began in the middle of the 19th century. The scientific foundations of aviation and aerodynamics were laid between 1799 and 1809 by an English baronet, Sir George Cayley. Cayley abandoned the ornithopter tradition, in which both lift and thrust are provided by the wings, and designed airplanes with rigid wings to provide lift, and with separate propelling devices to provide thrust. He demonstrated, both with models and with full-size gliders, the use of the inclined plane to provide lift - action of air upon a flat, inclined surface like that of a kite. In 1853, in his third full-size machine, Cayley sent his unwilling coachman on the first gliding flight in history. In 1842 the Englishman W. S. Henson, inspired by Cayley, patented a design for a monoplane (has only one set of wings) which he called an aerial steam carriage. Although only unsuccessful models of it were built, it was a brilliant prophetic idea. In 1890 French engineer Clement Ader built a steam-powered airplane and made the first actual flight of a piloted, heavier-than-air craft. However, the flight was not sustained, and the airplane brushed the ground over a distance of 50 m (160 ft). Inventors continued to pursue the dream of sustained flight. Between 1891 and 1896 German aeronautical engineer Otto Lilienthal made thousands of successful flights in hang gliders of his own design. Lilienthal hung in a frame between the wings and controlled his gliders entirely by swinging his torso and legs in the direction he wished to go. While successful as gliders, his designs lacked a control system and a reliable method for powering the craft. He was killed in a gliding accident in 1896. 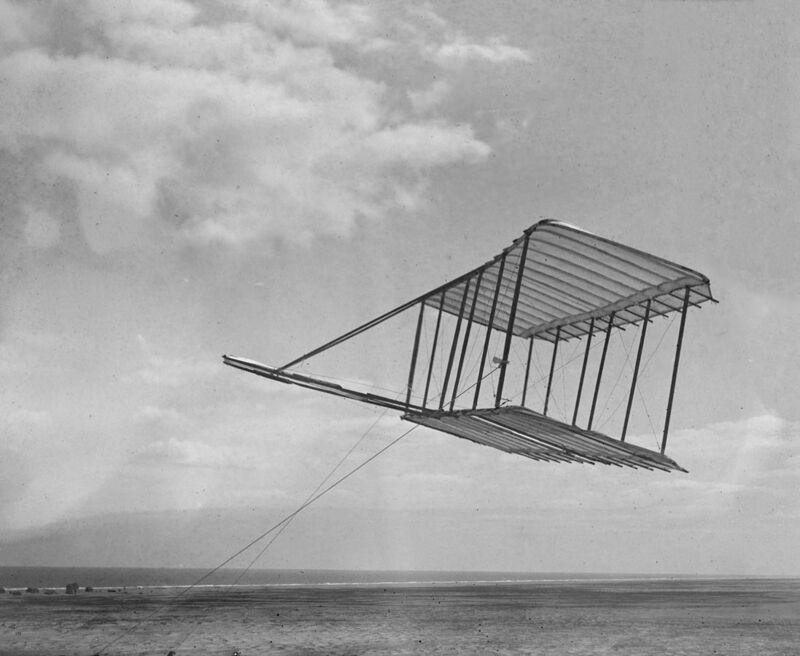 One of the few photographs of Wright brothers' glider flying as a kite. No photo was taken with a pilot aboard. The American brothers Wilbur and Orville Wright, inspired by Lilienthal, decided in 1899 to master gliding before attempting powered flight. First, for a few months, the Wrights built and flew several kites, testing and perfecting their new ideas about a flight control system. In 1900, they used this system on a man-carrying glider for the first time. Before they risked their own necks, they flew the glider as a kite, controlling it from the ground. They flew three biplane (has two wings, one above the other) gliders from the sand-hills near Kitty Hawk, North Carolina, and by 1902 had developed a fully practical biplane glider. Their great innovation was that their glider could have been balanced and controlled in every direction, by combining the actions of warping (twisting) the wings and turning the rudder for lateral control, and by using a device called an elevator for up and down movements without any need for the pilot to swing his torso and legs in order to control the flight direction. All flight control today has developed from this 1902 Wright glider. After mastering gliding they developed a biplane with a 12 horsepower engine and two propellers and made the world’s first true powered, sustained and controlled flight on 17 December 1903, this flight lasted for 59 seconds. But only in 1905 they had the world first practical plane, which could be banked, turned, circled and flown easily for an half an hour at a time. Though the Wright brothers were not the first to fly a heavier-than-air machine, their control system enabled the development of a practical and reliable airplane. This control system was developed through a few crucial experiments they have carried out with kites in 1899.